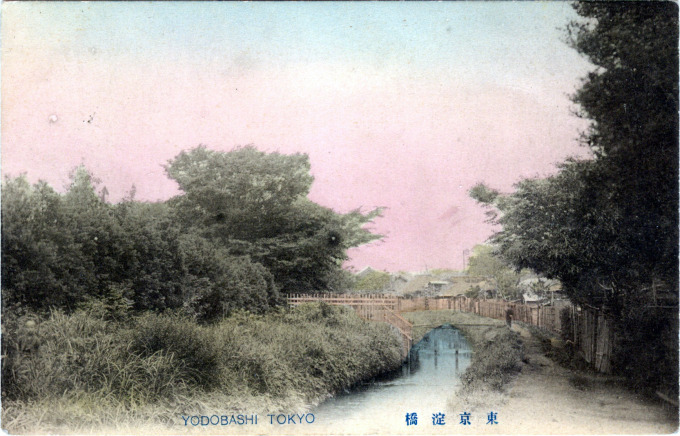 Yodobashi (Shinjuku), Tokyo, c. 1910. The area west of Shinjuku Station was historically known as Yodobashi, on an elevated plateau separating the High City [Yamanote] land from Tokyo’s Low City [Shitamachi]. The area first came into prominence as one of the stations along the Koshu-Kaido, one of the five major highways of the feudal period. It remained largely rural on into the Taisho Era (1912-1926), until after the 1923 Great Kanto earthquake. In 1898, the Yodobashi Water Purification Plant was opened in Shinjuku, Japan’s first modern water works. It would be shut down in 1968; replaced with Tokyo’s largest concentration of skyscrapers, including the Keio Plaza Hotel and the Tokyo Metropolitan Government buildings.